Northern Safety associates cleaned up Frankfort’s Industrial Park Drive on Saturday, June 15, 2013. The cleanup was initiated by the Company’s Green Team as part of their ongoing green efforts. Starting at 9:00 am Saturday, associates volunteered their time to pick up trash from both sides of Industrial Park Drive, from Bleecker Street to Welsh Bush Road. Matthew Marmet of Northern Safety’s Green Team worked directly with Ron Testa, Town of Frankfort Superintendent of Highways to coordinate the effort. The Town of Frankfort gathered and disposed of the bags of trash that were collected during the cleanup. “It’s great that the Town of Frankfort has been so supportive! 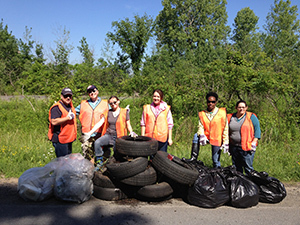 Folks from our Northern Safety Green Team, along with many of our other associates volunteered to take part in what will be a periodic cleanup of Industrial Park Drive. It just shows the pride that our team has in the place we work and our commitment to being good community members,” says Neil Sexton, Northern Safety’s President, Chief Operating Officer, and founder of the company’s Green Team. “The initiative promised to be fun, as well as impactful to the beauty of our area. We will, of course, be recycling everything we can from our cleanup efforts as part of our ongoing “Go Green” program, too,” Mr. Sexton continues. Northern Safety will be scheduling regular cleanups, as needed. The Company is committed to preserving the beauty of the community as well as the health of our environment.